This article was written By Stan Glick on 05 Jul 2015, and is filed under Reviews. 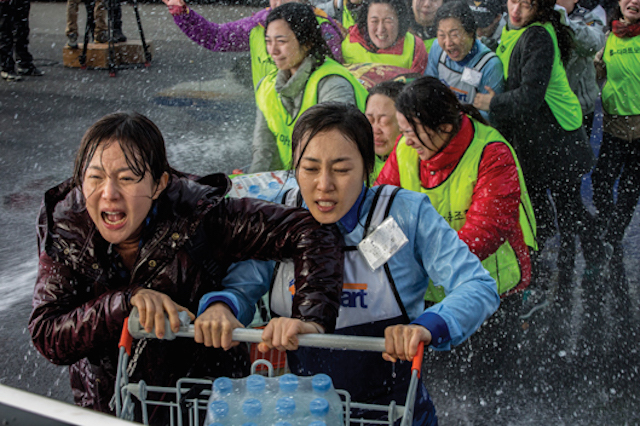 Cart is the second feature-length film from female director Boo Ji-young following Sisters on the Road (2008). It’s a powerful drama about a labor struggle in South Korea that is based on actual events. The Mart is a huge retail store that has both permanent employees, almost all of whom are men, and temporary workers, almost all women, many able to work only part time. To improve the bottom line, the upper level management (all men, like the mid-level managers) decides to layoff the female temporary workers (cleaners and cashiers) and outsource their jobs. The women respond by going on strike and starting a union. Later they are joined by some of the lower level permanent male employees. Management initially responds to these efforts with indifference, then with ploys to divide the strikers and break their solidarity, and ultimately with the use of violence by hiring goons to attack the strikers. I saw Cart at a press screening before NYAFF began and was quite impressed, though I wondered about some aspects of it. For example, I was surprised that the only media coverage depicted was a brief television clip in which the on-site anchor, a woman no less, essentially spouts the management’s point of view. There seemed to be no media interest in the harsh violence meted out to the overwhelmingly female strikers, even when it resulted in the child of one worker being hospitalized in serious condition. I do not know how closely the film conforms to the actual events that transpired but my impression was that there have been changes, some perhaps significant, in order to create a more dramatic cinematic narrative. This is not surprising, nor is it meant as a criticism. It’s one of the inevitable results of making a movie based on real events. In any case, the film effectively shows the remarkable solidarity of the women strikers against the near intransigent attitude of management, which couldn’t care less about the effect of its attitude on low-wage workers who desperately need their meager incomes to support their families. The film concludes with information about the eventual outcome of the strike, which was quite lengthy. Cart will be shown at this year’s New York Asian Film Festival on Monday, July 6 at 8:45pm. Director Boo Ji-young and producer Shim Jae-myung will be in attendance. Presented with the support of Korean Cultural Service in New York and co-presented with The Korea Society, this screening is part of Myung Films: Pioneers and Women Behind the Camera in Korean Film, a special focus sections of NYAFF.